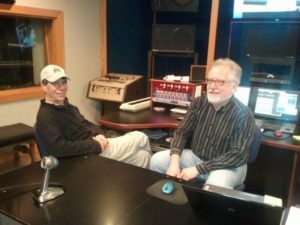 Perry Cheatham wasn’t around when SoundTrax first opened its doors, but he might as well have been. He’s been part of the SoundTrax family for over 35 years, and as Chief Engineer for 27 of those years, Perry’s heart and soul live in every corner of the building. Perry’s from just up the road—Henderson NC. He headed North after High School, graduated from Brown University with a double degree in Electronic Engineering and Music. His early career included a stint with legendary concert recorders Fedco Audio Labs. While bouncing around the country on the “Fedco Truck”, Perry worked with Count Basie & Woody Herman, the Paul Winter Consort, and was on the crew that recorded one of the all-time great live rock albums of the 70s: “Waiting For Columbus” by Little Feat. By the time Perry arrived at SoundTrax in 1980, he already had a wealth of recording knowledge and experience under his belt. Over the next 10 years, however, Perry transformed a small room that began in the back of a stereo store in Cary into the top commercial studio and audio post facility in North Carolina. He designed “The Quietest Room In the South”, our current facility on Jefferson Street in Raleigh. And Perry was one of the very first engineers in the country to outfit a studio with a complete digital recording and editing system—the AMS/Neve Audiofile system, which was in use here from the late 1980s well in President Obama’s first term. Perry loves sailing. When he and his wife Susan aren’t hiking or skiing, they’re on “Grace”, a 38-ft Cabo Rico sailboat. It’s docked in Oriental, NC but in the past few years Perry & Susan have piloted Grace almost everywhere on the Eastern Seaboard. When he returns, he always brings an incredible collection of photos and stories. And while we’re always glad to see and hear the stories…we know that sooner or later the conversation will return to Perry’s other true love: Sound. © 2019 SoundTrax Recording Studios. Website by AndiSites Inc.